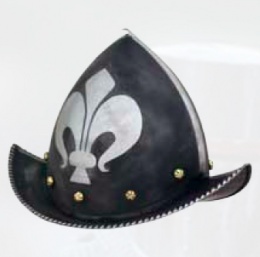 The Morion is a distinctive open helmet style with a flat brim and a crest going from front to back. They rose to popularity in the 16th and 17th centuries and from this period comes this version of the Morion helmet. Featuring a nicely decorated front, this head gear is made from 18-guage steel. This page was last modified on 13 May 2014, at 16:30.